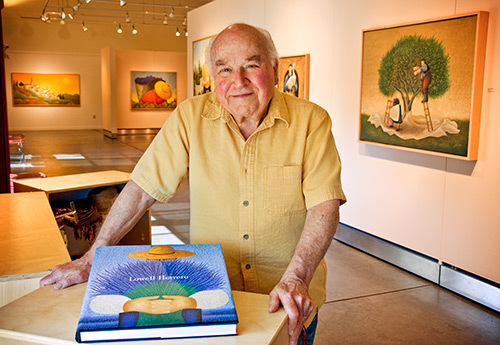 Throughout a dynamic life that has spanned the Great Depression, the Second World War, the rise of Silicon Valley, and the dawn of the twenty-first century, Lowell Herrero has turned his passion for living into art. From his home in California, he has traveled to Tuscany, Provence, and Spain, absorbing the lessons of their sensuous landscapes. The colors of horizons and rich earth, the sensations of sunlight, and the fragrance of flower-covered hillsides mingle in his imagination and flow through his paintbrush onto his canvases. Herrero feels a deep affinity with farmers working the land. He renders them bursting with life, over-large, and enduring extensions of the very soil they cultivate. In his paintings, vineyards stretch into the distance as grape pickers enjoy lunch under a cloudless blue sky. Lavender harvesters bend to their task, and a field of rolled bales tells us the hard work of haying is at an end. Each painting invites us to smile with pleasure and enjoy the inner vitality and plenitude of the landscape. But above all, the paintings project the irrepressible joie de vivre of an artist who knows how to live.